Talayotic Culture of Minorca is part of the Tentative list of Spain in order to qualify for inclusion in the World Heritage List. The Talaiotic Culture is an ancient society established on the Balearic Island between the Iron Age and its replacement by the Punic and the Roman cultures. 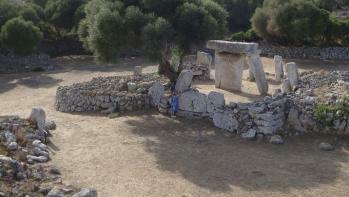 Menorca Island has many stone remains of that culture, of which 25 are to be considered to be nominated as WHS. I used to have family vacation on Menorca, the least developed and most natural island on the Balearic Islands. Vacation on Menorca is rather laid-back. Development on Menorca was slow, and unlike Ibiza and Mallorca, huge concrete hotels and vacation town are absent. Beaches are very nice, with clear blue water, often enclosed between trees-covered cliffs on both sides. The talaiotic remains are spread out all over the island, and you cannot miss them (least of all one just after exiting the airport coumpound). It would take some time to cover all of the 25 sites. Public transport is efficient, but renting a car is cheap and would save a lot of time. I would recommend to at least see the two most emblematic sites, which are Es Tudons and Talati de Dalt. -"navetas", which are pyramide-like funeral buildings, only found on Menorca. The name naveta come from the catalan word for boat, as those structures often look like upside-down boats. -"talaiot" which are look-out towers, most of the time round and on top of small hills. The name comes from the catalan word for watch-tower. The Naveta de Es Tudons, is close to Ciutadella, the town on the west side of the island. There is a parking lot, from which it is a 5 minutes walk to the Naveta. Entrance is 2 euros (free in winter). Up to a hundred bodies was uncovered here. It was built with large stones. We cannot get in the inside but it is possible to get a glimpse of it. La Talati de Dalt, is close to Mao, the town on the east side of the island. It is a settlement with different typical structures: a big taula with a second stone standing on its side. A big talaiot on top of a small hill and. A cave with columns (an hypostyle) and several other walled buildings forming a village. This site is very nice to visit, with the stoned ruins in the middle of a field with various trees growing in between them. Entrance is 4 euros (free in winter). In Cales Coves, you can combine archeology and swimming in the blue waters. The cliffs above Cales Coves are filles with cave tombs, some of which are easy to access. There is no entrance fee, but expect some crowd in sommer as it is one of the most famous cove for sailing and swimming (also expect to encounter some nudists). Altogether, I believe that this sites have an OUV, similar to contemporary Su Nuraxi di Barumini in Sardinia and earlier megalithic temples of Malta.